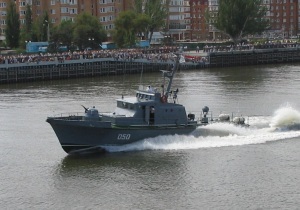 AK-388 (hull number 43) is a Project 1400M Grif artillery patrol boat, designed for combating with boats, ground forces support, providing naval patrol service. AK-388 was laid down at shipyard More in Feodosia, Ukraine. Commissioned on December 17, 1981.